When I was first approached about creating some recipes using the line of Private Selection™ Finishing Butters, I immediately thought of my oven fries. 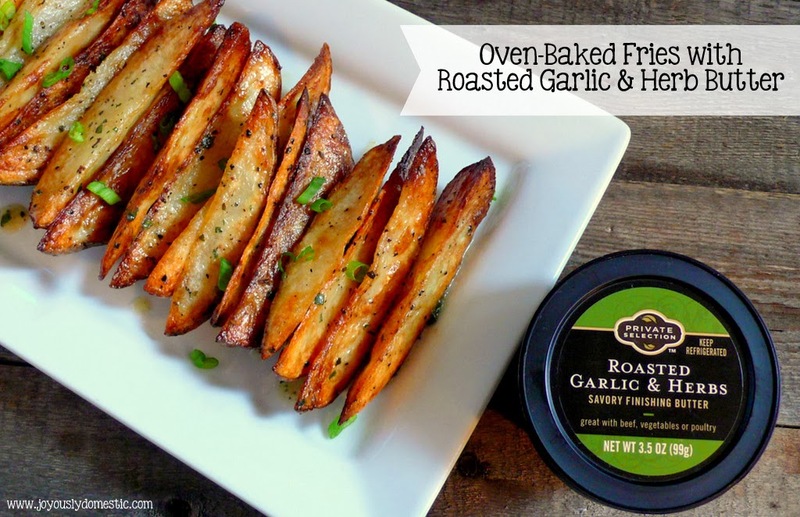 They have always been a top favorite in our household and I had a strong feeling that the Roasted Garlic & Herbs Finishing Butter would be magnificent with these fries. There are six flavors - three sweet and three savory - in the Private Selection™ Finishing Butters line. I AM CURRENTLY HOSTING A GIVEAWAY CONTEST COURTESY OF PRIVATE SELECTION™. ENTER HERE FOR A CHANCE TO WIN A PRIVATE SELECTION™ KIT FILLED WITH A COLLECTION OF ARTISANAL-INSPIRED INGREDIENTS ALONG WITH A $100 GIFT CARD - ALL SHIPPED RIGHT TO YOUR DOOR! CONTEST ENDS SUNDAY, DECEMBER 8, 2013 at 11:59 P.M. EST. UPDATE 12/9/13: GIVEAWAY NOW CLOSED! These fries have the perfect combination of crisp exterior and fluffy interior. People who try them are amazed at just how fabulous they are without any frying. The trick is in the technique that I use to bake them. (Covering the baking pan tightly with foil during the beginning stage of baking is the key!) Once you start making fries this way, I doubt that you'll ever switch back to any other way. The Private Selection™ Roasted Garlic & Herbs Finishing Butter worked so incredibly well with this recipe. I loved the ease of using the finishing butter. All of the flavor components were all right in the butter, so not much else was needed in terms of ingredients to take basic baked fries from mundane to magical! Click HERE for digital coupons (loadable to your Kroger family of stores shopper's card) for savings on these and other Private Selection™ products. Allow cut potatoes to soak in cold water for 30 minutes. Drain, then pat dry with a clean kitchen towel. Drizzle about a tablespoon of oil onto a large baking sheet and spread it around with your fingers. Place a piece of parchment paper cut to fit onto the oil-coated baking sheet. Drizzle another tablespoon or so of oil onto the parchment paper and spread it around to coat the paper. Sprinkle on some salt and pepper into the oil. Then, add the potatoes to the baking sheet and drizzle onto potatoes 1 -2 more tablespoons of oil. Sprinkle a bit more salt and pepper onto potatoes. Make sure potatoes are coated well in the oil. Spread in an even layer across pan. Cover tightly with foil and bake at for 10 minutes. Then, remove foil and bake another 10 minutes. Next, flip potatoes over and bake another 10 - 15 minutes or until super crispy. Garnish with parsley, chives or green onions, if desired. Serve immediately or keep on a baking rack set over a baking sheet in a warm oven until ready to serve (up to fifteen minutes). This is a sponsored post on behalf of Private Selection™. Sponsorships help with the costs associated with operating and maintaining Joyously Domestic, the blog. All opinions and views expressed within this post and on any social media referencing my use of Private Selection™ products are 100% my own based upon my own personal experience. I do not accept payment or sponsorship in return for simply providing positive feedback. The Kroger family of stores includes Kroger, Dillons, Bakers, Gerbes, Fred Meyer, King Soopers, City Market, QFC, Ralphs, Smiths, Owens, JayC, Food4Less Fremont, Payless and Foods Co.
Hi, Nancy ... I am just loving these butters. I roasted some salmon tonight and had the lemon pepper butter melted over it. It was wonderful! Thanks for visiting. Blessings!